One of the best types of silver investments for first time investors is physical silver. With physical silver, you will be physically handling and exchanging goods. This gives you a good idea of how ‘liquid’ silver is, in other words, how readily you can transact with other buyers and sellers and how quickly you can convert your investment to cash. 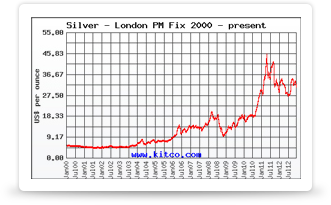 The two primary forms of physical silver investments are silver bars and silver coins. The hassle of having to store all those silver bars in one place can be off-putting to some. A more compact alternative is investment in silver coins. If you’ve ever stayed up late at night and seen infomercials running on TV selling collections of coins for a “low, low price”, you’ve probably wondered why the collection costs so much when the coins themselves are quarters and silver dollars and are worth so little as currency. While government-minted coins can be used as legal tender, they can also be used as solid investments for the silver they contain. When you look at a coin, even in passing, you’re bound to notice some distinctive features. The year of production is stamped and designs on both the front and back look different from year to year. Sometimes special edition coins come out, such as the state coins or commemorative editions. The design on the front side of the coin is called obverse, while the back side has a reverse design. Each coin will usually be printed with the year and face value on the front and purity and weight stamped on the back. The best coins sold for investment purposes are of uncirculated type. These are in mint condition and have not been subject to the wear and tear that comes with exchanging coins as currency. One of the reasons why silver coins are a great investment for first time investors is that they can be accumulated in large quantities at a low price. Popular government- minted coins among investors include American Silver Eagles, Canadian Silver Maple Leafs, Austrian Silver Philharmonics, Chinese Silver Pandas, Australian Silver Koalas, and the UK Silver Brittania. Coins are physically tangible, so they are easily accessible at any time should you require them. Unlike large silver bars, coins are small and compact. You can store a large number of coins in a small space for a low price. Besides giving you something nice to look at, these different designs make the coin collectable. When certain coins are minted in a lesser quantity in a particular year, their availability in circulation is rare and so they become highly collectable. Knowing that governments have given their seal of approval on the coin instills confidence in potential buyers, making it highly liquid as well. Government coins carry a higher premium than bars because their intrinsic value lies in their collectability. For the most part, if you own an older silver bar you most likely will get less of a return on your investment. It is just the opposite with silver coins. Their age and relative rarity are what hikes up the premium on the coin, allowing you to make a tidy profit from the sale. That they are also able to be used as legal tender is a nice bonus. In the event that the price of silver falls, you won’t completely lose out as you would if you had invested in a bullion bar. You still have a coin with monetary value on your hands that you can use as currency.